I've been getting a lot of questions lately about how I make skirts for my kids. Instead of answering everyone individually, I've decided to make a blog post. I made this skirt for VBS at our church this past summer. 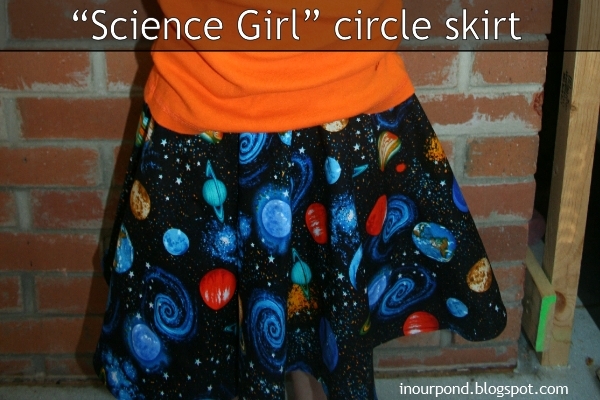 The skirt is made from quilting fabrics, the planet on the outside and a swirled blue for the inside. This isn't the best picture to show off this repurposed dress. I bought a skirt from Goodwill that was too large for Dragonfly and a long-sleeve t-shirt from Walmart. I opened the elastic casing on the skirt and tightened the elastic. Then, I sewed the casing back together and sewed the skirt onto the t-shirt. 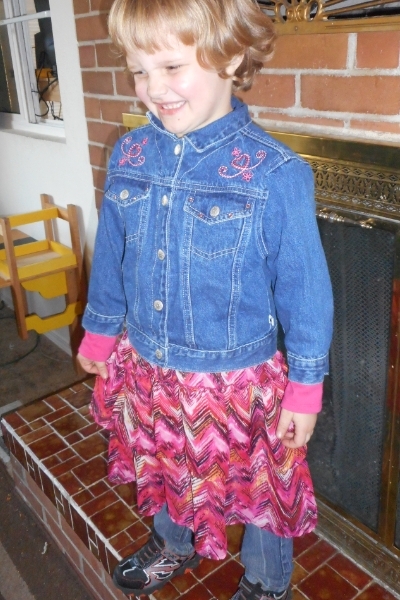 With this outfit, she declared that she was "all ready for fall." Dragonfly is currently fascinated with squirrels. 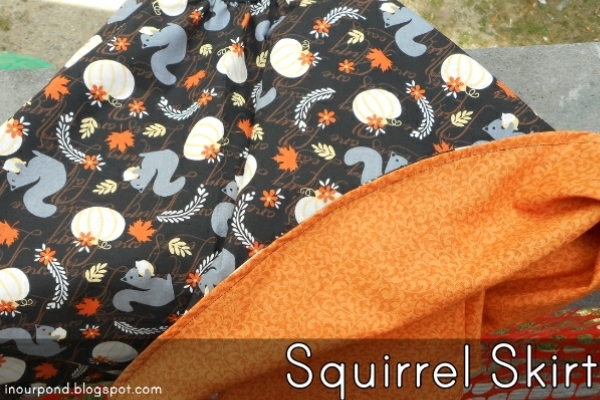 When I saw this fabric, I knew it would be perfect. This is her official fall skirt. 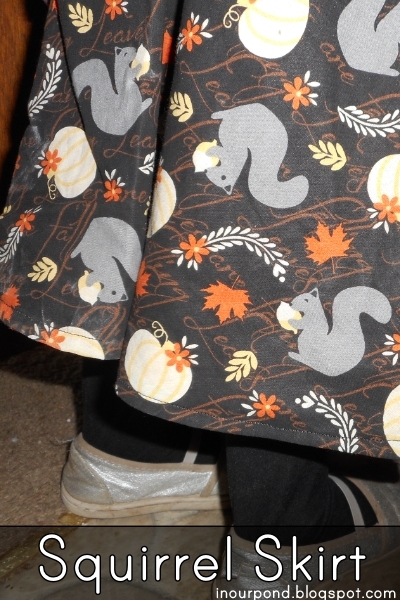 Here's another look at the squirrel skirt. I really like the fabric I found for the lining. I started with a yard of each fabric. Begin by laying the fabrics on the table, right sides together. Carefully fold them in half (hot dog way) and then in half again (hamburger way). The end result should be a square. Because of math, you can make a circle out of a square. 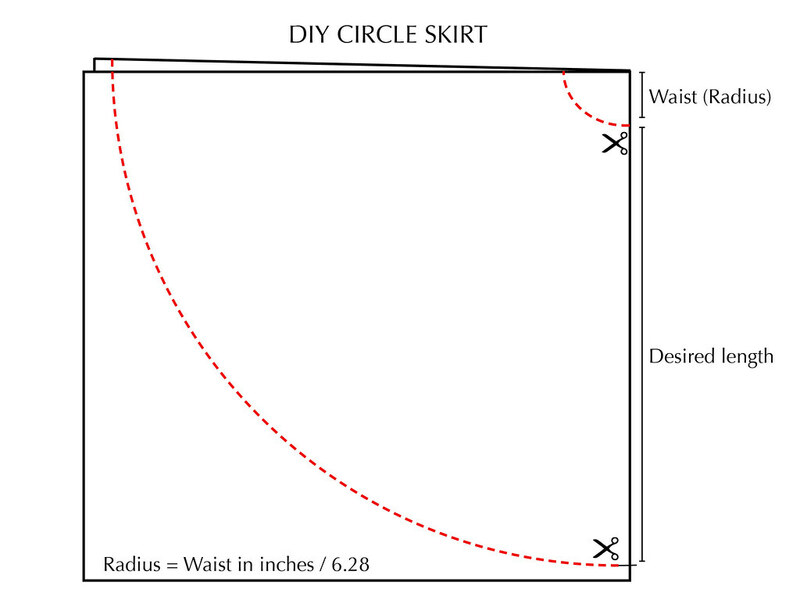 Cut your fabric according to the diagram. Carefully, unfold your fabric and pin around the edges. Sew the outer edge first, then turn it right side out. Next, sew a top stitch to flatten the hem. I prefer fold-over-elastic for the waistband. Sandwich the elastic over the edge of the fabric and sew with a long zigzag. And, it's done.